there are no real numbers in this DIY project, I just liked the title. Awhile back I posted about a lucite stool I picked up from Craigslist. It originally had an old vinyl cover that smelled something awful- yuck! I ripped that sucker off and temporarily replaced it with some leopard print fabric. Then last week I got paint itchy. You know that feeling where you are just itching to paint something? OK, maybe I'm the only one who gets that. I decided to do another monogram based on the Leotine Linens designs (I just cant get enough). 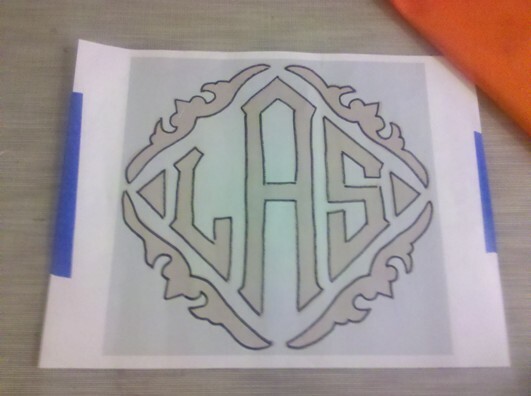 I used photoshop to design my own monogram and printed the largest size I could using an 8 1/2 x 11 sheet of copy paper. I traced the outline in black marker so I could see it through my orange fabric better. With a disappearing fabric marker I traced my monogram on the fabric. I painted a few thin coats of the Tulip paint, rather than one thick coat and it worked perfectly. And here is how my new married monogram stool came out! After I took these photos I thought about taking it off and adding piping detail to make more of a taylored cushion- doing that might get rid of the puckering that's happening around the edges. But after I kept looking at it, I kinda like the soft look of the puckering. It's like a pillow is just resting atop the hard lucite. It also happens to be the nature of the thin fabric I used. So it stays as is for now. With all my projects space in the family room seems to be limited these days. Because of that, the Lucite stool lives next to the fireplace for now. Plus its easy access when someone needs to grab a seat in a flash. PS- when I got this little stool it was covered in little marks and scratches. To clean it I picked up this set from The Container Store and it worked WONDERS! Highly recommend it for any Lucite purchase. This looks fantastic! I'm super impressed with the monogram you created -- so great. Wow, this turned out gorgeous! Photoshop is a lifesaver, you can create such amazing projects. Thanks for sharing this one. You are ridiculously talented! 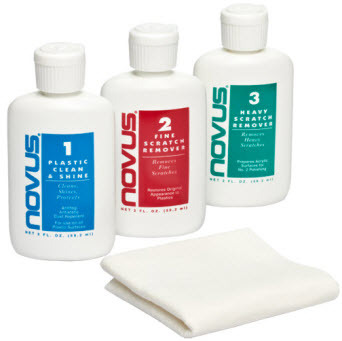 And thanks for the tip on the plastic cleaner, the one I have is useless! Love it!! The monogram is awesome and looks great against the orange and lucite! You did it again!! Pretty sure you're the queen of really cool DIY monograms! I'm definitely going to feature your handiwork in this week's Five for Friday!! Love it! Once again, I love it! The orange & white is a great combination. It looks amazing! I love the monogram! Fabulous, I love a monogram on just about anything. So creative and handy you are! Found you from Full House. looks great; love your signature orange!! What a fantastic $0 project! I am so impressed. I love that monogram. Have you seen the kit you can get from craft stores so that you can etch wine glasses? 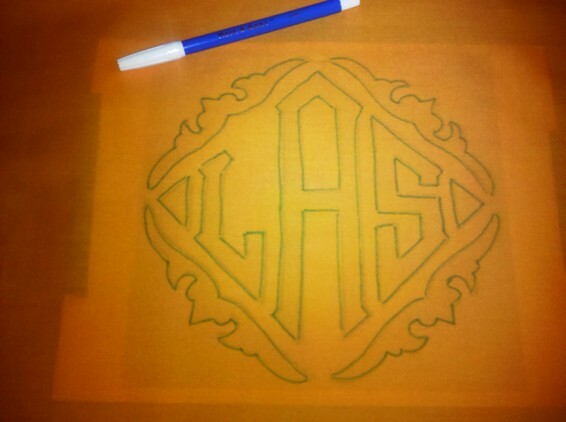 Maybe you can create a stencil with the monogram! This is amazing! I love everything about it - the monogram, color, and especially the lucite! noooo Linds you didn't! oh my! you are amazing lady! Wow, I can't believe you created this by hand! you are so creative- that looks great!! This is an amazing DIY! You are so clever...I can't believe how easily you got such a luxe monogram look for so little! Brilliant! This is just absolutely adorable. You did a super job! This looks so awesome! I need a disappearing fabric marker! That's what's missing in my arsenal! Putting that on my list. So glad the painting went well. It's not far different from my chair painting concept. Gorgeous! Care to guest post about it (if you haven't already done a million)? Gotta love Craigslist. Great transformation!! Can you please do a tutorial on how to make this monogram on photoshop? It is so cute! I am a huge fan of Leotine linens. Anon, I wish I had a tutorial myself on Photoshop- to be 100% honest this took FOREVER to do and there were a ton of mistakes that I had to fix once I printed it out. I'm sorry I dont have a better answer for you, but I'm just being honest in saying I have no clue how to work Photoshop :) I will say that Powerpoint is much more user friendly and I like to use that alot more.